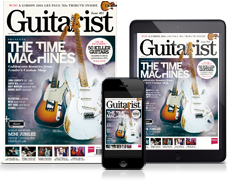 When Fender launched the first ever mass-produced electric solidbody guitars in 1950 - the blonde Esquire and Broadcaster - the instruments became the de facto leaders of a brand-new niche in the music industry, as well as progressing the art of guitar-building as a large-scale industrial process. Company founder Leo Fender’s aim was to economically and consistently manufacture a hard-wearing product that improved performance in areas such as feedback, intonation and action and was also relatively easy to maintain and repair. Because the company’s manufacturing practices have evolved over time, it can be difficult to trace how, exactly, things used to be done at Fender. As a result, a mythology has arisen within guitar culture concerning the intricacies of how these old instruments were put together - from the obscure origin of ‘clay’ fretboard dots to the dark art of guitar finishing. But careful research into golden-era guitars yields up insights that reveal a clearer picture of Leo’s methods. It’s worth remembering that good, oldfashioned simplicity was key to Fender’s initial success during the 50s and early 60s. Under Leo’s watchful eye and driven by his engineer’s instinct, the company’s guitarbuilding techniques were being constantly refined and streamlined as a means to enhance quality as well as profit. Despite big advances in massmanufacturing tech since Leo’s heyday, guitar builders at Fender and elsewhere have been revisiting old techniques and designs in order to recreate some of that vintage magic. “Each guitar is a journey,” Mike reminds us. And in the case of blonde Fender guitars, it’s a pilgrimage that stretches way back into the company’s past, to a time when people were only just beginning to take note of solidbodies (and were still referring to guitars equipped with pickups as ‘electric Spanish’ instruments). As the post-war economic boom was happening, and as television became an ever more dominant part of popular culture, Leo Fender embraced the medium by rebranding his new invention the Telecaster in 1951. Its light-coloured finish positively glowed from the screen. Although some variation is evident among blonde finishes of the early 50s, they are often characterised by a distinctive yellow tint that is often described as ‘butterscotch’. In 1954, however, when Fender began using automotive-industry paint, this changed to a markedly lighter shade. “They used DuPont Duco colours - the same as was used on cars,” Mike says. This shift to a more UV light-resistant formula inhibited the degradation of pigment and the discolouration associated with ageing, with knock-on effects on the guitar’s look. “The original guitars we call ‘butterscotch’, weren’t necessarily that colour when they were new,” explains Mike. “I think the actual composition of the finishing materials changed and so they didn’t yellow quite as much. I’ve seen some a lot more butterscotch-coloured than others. There’re always inconsistencies in the colours, and who’s to know for sure if they changed the formula, or what got changed and why? But I do know Fender listened very carefully to customers. “As far as why it went from ‘butterscotch’ to a much whiter blonde - it could have easily been that people requested it. Or, after a period of time, maybe they got too yellow and people complained about it. The thing to remember is, back in the day, when it was all new, there wasn’t all this history of, ‘it’s supposed to be this way’. Y’know, they were inventing it as they went along. The method of manufacturing these guitars had never existed before. This was part of the genius of Leo Fender - not only did he innovate the electric guitar and create these solidbody designs, but, more importantly, he created a method of manufacture so that it could be repeated. He was constantly tweaking and improving. A great deal of that process lay in the hands of Fender’s craftspeople, with each imparting their own unique personal touches to every guitar that left the factory, as Fender Custom Shop Painter, Jay Nelson, points out: “There are slight variations.” Indeed, this can be particularly noticeable when it comes to blonde finishes. Blonde Fenders not only look unique, but they sound unique too - a factor determined indirectly by the finish itself. 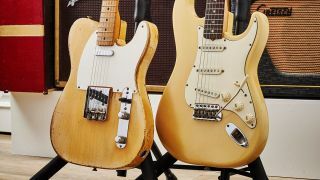 Over time, the sound of a typical blonde vintage Fender is also liable to change to some extent, as the natural ageing process of the nitrocellulose finish and the ash body progresses. Blonde remained the standard finish on both Telecasters and Esquires during Leo’s entire tenure at Fender and was simultaneously offered as a custom colour option for Stratocasters, Jazzmasters and Jaguars, although the method of painting the bodies remained indistinguishable. “They might look different with time, but as far as the way they’re finished, it’s the same exact way - it’s the same undercoat and the same materials,” says Jay. “Back then, whoever was painting and whatever they got, they would just paint them. The paint goes on the same way!” As it still does in the Fender Custom Shop to this day.